Absolution will be part of the shorts category on Saturday October 27th at 2pm and Sunday 28th at 1pm. Absolution has been selected for Dances With Films 21! Absolution will screen at 2:45pm on Friday 8th June at TCL Chinese Theatre in Los Angeles. Director Stirling Matheson, Producer Bryan Boyd, and myself will be present, and a Q & A will follow the film. We are ecstatic to be selected as part of this year's festival and can't wait for the film's world premiere! Friend and fellow Butler alum Jess started The Whole Dancer as a resource for dancers at all stages of their career to help them cope with the inevitable struggles we all face in the profession. She focuses on health and body image, injury prevention, and mental wellness, providing invaluable help and information to dancers of all ages. She recently asked me if I would talk to her about my path as a freelance dancer so she could share my experiences with others. My career certainly has not evolved the way I expected it to, and I have had to learn how to be a dancer without a long-term contract. While freelancing isn't what most of us plan to do when we dream of becoming a dancer, it is certainly possible to build a career in this way. I hope hearing about others who have done it will encourage dancers struggling to find the kind of work they'd imagined to be persistent and not give up on their performing dreams. In almost 8 years as a professional I've found that the best opportunities always come through the most unexpected places, and only by being determined to stick with this career have I been fortunate enough to have experiences I never could have imagined. Click here to read about the premiere and the process in the Indianapolis Star! When Stirling Matheson, the director of Ballet Theatre of Indiana, approached me about recreating my 2016 work Absolution for film, I was interested, but skeptical. He had a vision of a site-specific piece, filmed at night, with rain effects and fog. I wasn't sure if this meant Stirling would show up with a hose and camcorder, but I was willing to give it a go anyway. As it turns out, Stirling had enlisted the help of Emmy Award winning filmmaker Bryan Boyd to shoot, co-direct, and edit the project. The addition of a generous grant and loan of an Angenieux camera lens set us on the path to create something really special. We gathered at The Ruins in Holliday Park on a Wednesday evening in late August, and gave ourselves 5 hours of darkness to film every group shot, close up, and angle needed to capture the story of this piece. Stirling had, in fact, built a working rain machine, and there was a dedicated grip on hand with plenty of fog. The first time we ran the piece through entirely, it was exhilarating. At least for me. The dancers, who were now at the beginning of a long night of dancing in cold "rain", may have felt differently. Working with Stirling and Bryan to create this film piece by piece was such a fulfilling experience, and one that I hope to have to opportunity to experience again. After many hours of retakes, adjustments, quick runs in and out of the water, and plenty of coffee, we called it a wrap and packed up for the night. The next week, the real work of editing together all the shots we acquired began. As I live in London, and Stirling and Bryan are in Indianapolis, trying to collaboratively edit a film presents a few logistical issues. Thankfully technology has made it possible for us to share ideas back and forth, and I've delegated two dancers to be my representatives in the studio. The other important aspect of this project was, of course, the music. Fortunately for us, my sister (Caleigh Kilijonienė) and her husband (Viktoras Kilijonas) are talented musicians, and together they created an original track that meshed perfectly with the existing choreography. As an artist it's always an honor to work with creators in other genres, so to have the opportunity to do that with my own sister added a level of investment and emotion into this project that would have been difficult to create otherwise. The final product will be premiered in Indianapolis on November 5th as part of a benefit for Ballet Theatre of Indiana. The film is also being submitted to film festivals around the world, and with any luck it will soon be arriving at a cinema near you. It is always a pleasure to work with the dancers of BTI, and this project was no different. I hope to have the opportunity repeat and expand my collaboration with the company and to bring even more dance to the big screen through film. This summer started with an incredible opportunity to work with New English Ballet Theatre, performing Daniella Cardim's Vertex and premiering Jenna Lee's The Four Seasons. Getting back into full time rehearsals was challenging, but working with such a talented team of dancers and choreographers is what every dancer hopes for. I was especially fortunate to be able to work with Jenna Lee as she choreographed The Four Seasons to the recomposed score by Max Richter. It was particularly interesting, as I was in the original cast for Wade Schaaf's The Seasons at Chicago Repertory Ballet in 2014, and am very familiar with the score. Watching another choreographer interpret the music in a new way enabled me to hear things I missed before, though, and gave me a new appreciation for the entire piece. The NEBT company was small this year, and as there were only 5 women, each of us took on the role of a soloist. The highlight of the entire experience for me was creating the Autumn 2 solo with Jenna. It's always an honor and a challenge to have work created specifically for you, and Jenna's innate musicality and ability to connect steps in a logical way made this solo particularly personal for me and especially enjoyable to dance. Near the end of the contract the company got the honor of meeting and being coached by ballet legend Darcey Bussell. She is an inspirational dancer, fountain of dance knowledge, and generally nice person, and I will always treasure getting to work so closely with her. More photos and videos to come soon! After a few weeks of hard work, the dancers of Ballet Theatre of Indiana really brought my piece to life (or death, in this case). Seeing Absolution performed at the Toby Theatre in the IMA was a great experience, and I couldn't be happier with the end result. Thanks to all who came to support me and the company, it always means so much to have friends and family in the audience! Special thanks to my dancers: Abigail Rose Crowell, Haley Cipot, Cheyanne Darniell-Elam, Megan Noonan, Christina Presti, Lauren Nasci, Miriam Smith, Audrey Robson, Catherine Jue, and Annie Mushrush. New choreography premiering with Ballet Theatre of Indiana October 27th & 28th! Today was the first rehearsal for my new piece titled Absolution, and already I'm starting to see my vision for this creation come to life. I'm very excited to be working with the dancers of Ballet Theatre of Indiana on their fall production of Myths and Monsters at the Indianapolis Museum of Art (IMA) on October 27th & 28th. My work will be one of five pieces performed in the show, an evening incorporating a variety of ghost stories, local lore, and generally creepy themes just days before Halloween. You can stay updated on my progress here, and if you find yourself in the Hoosier State this October I hope you'll come join us for an exciting evening of new works. All the information you need, and how to buy tickets, can be found here on Ballet Theatre of Indiana's website. In May and June of 2016 I had the amazing opportunity to work and perform with English National Ballet for their Swan Lake in-the-round production at Royal Albert Hall. There were more than 30 guest artists hired, and 60 swans in the corps de ballet. Over the course of two weeks we performed for over 50,000 people including Princess Beatrice and the Duke of York. 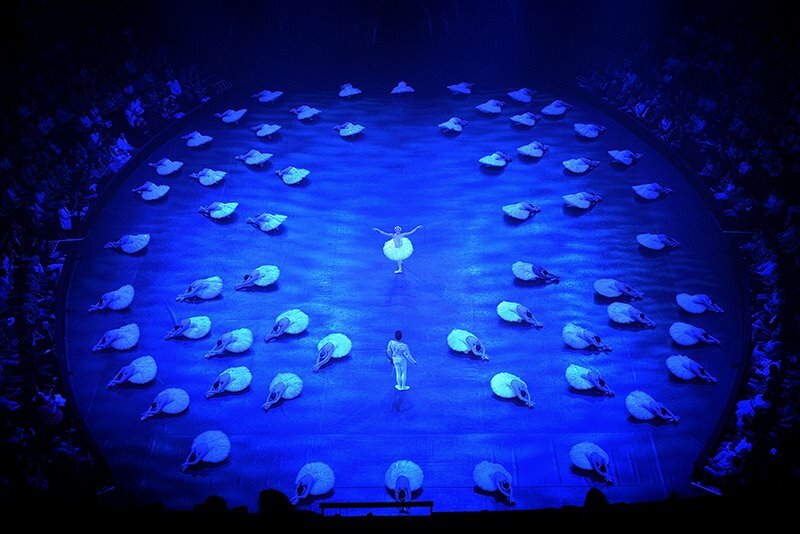 Performing on a circular stage presented a host of challenges for the dancers, but created a truly immersive experience for the audience. Hearing their response at the end of every performance was a daily reminder of why we all chose this profession. Taking part in this production has helped shape my career and my growth as an international artist, and dancing at Royal Albert Hall is an experience I will never forget. Read more about my experience becoming a swan on English National Ballet's blog!